Welcome to the first Guesthouse of the University of Leoben! The guesthouse mineroom is in operation since October 2016. This global high-volume passive house was constructed as timber framed structure and is located at the corner of Josef-Heissl-Strasse next to Anzengruberstrasse. 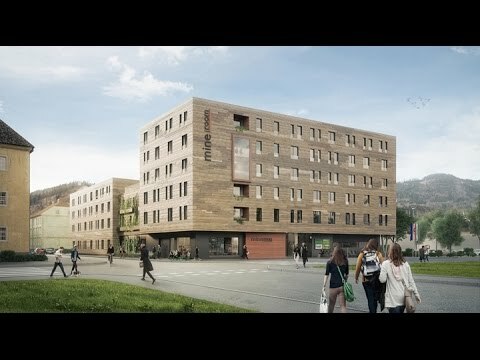 You can easily reach the Montanuniversity in Leoben within 10 minutes by bike. The generous foyer invites you to hang out and meet new people! This new guesthouse offers various room categories tailored to your needs. Apply now to be part of the mineroom-community! NEW: We also provide bicycles! You can now borrow them for free! You are allowed to host overnight guests for a maximum of 10 days after announcing them to the OeAD-Housing Office. We charge a fee of EUR 15,00 a night a guest. If a guest is staying over the weekend, we do have to charge a flat rate of EUR 45,00. Upon request we provide an extra bed including bedding. Please let us know prematurely on the online platform or during the speaking hours of the housing-coordinator if you like to host a guest.